Our strategy to study the nature is (1) to describe distribution of element and isotopes of the planetary materials, (2) to solve physics-chemical equations, then (3) to discuss the significant processes that formed the material as is. We started to develop analytical facility together with analytical techniques. The first instrument was a good-old-fashioned thermal-ionization mass-spectrometer. The thermal-ionization mass-spectrometer is abbreviated as TIMS. We dissolve a rock by acid, extract elements by ion chromatography, add isotope spike to them, load them to filaments, ionize, count number of ions after mass spectrometry, then estimate element concentration and isotope composition. After the TIMS experience, we started expand the analytical facility not only to analyze the whole rocks but also gas and minerals. For gas, we have installed gas-isotope-ratio mass-spectrometry. For minerals, we have installed instruments that utilize electron and ion probes with diameter of a few microns. After the fourth instruments were installed, we found the facility should be rather referred as a system. 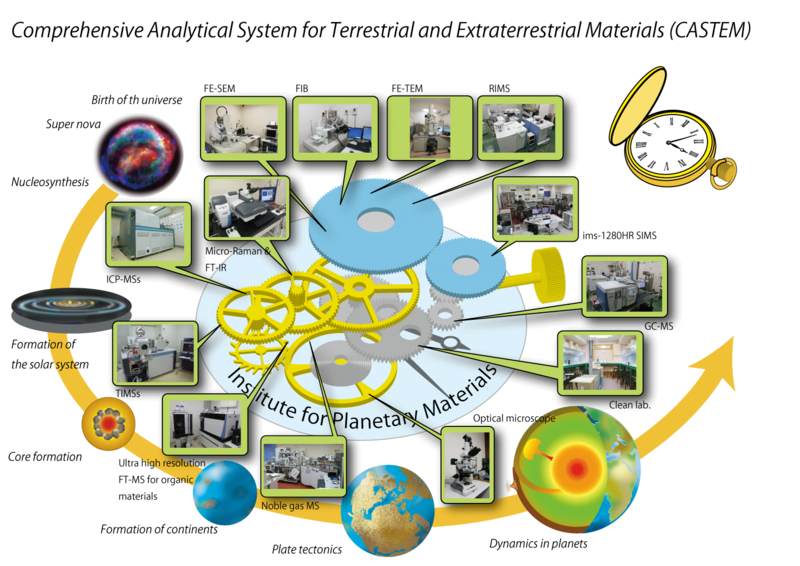 With our ambition, we name the system as Comprehensive Analytical System for Terrestrial and Extraterrestrial Materials (CASTEM). Instruments work as a well greased machine. CASTEM sees object of centimeter and nanometer. We envision CATSEM operating as a comprehensive analytical system continually evolving toward greater accuracy and higher spatial resolution. Data produced via this system will provide important information regarding the origin and evolution of planetary bodies such as the Earth, Moon, Mars, and asteroids. 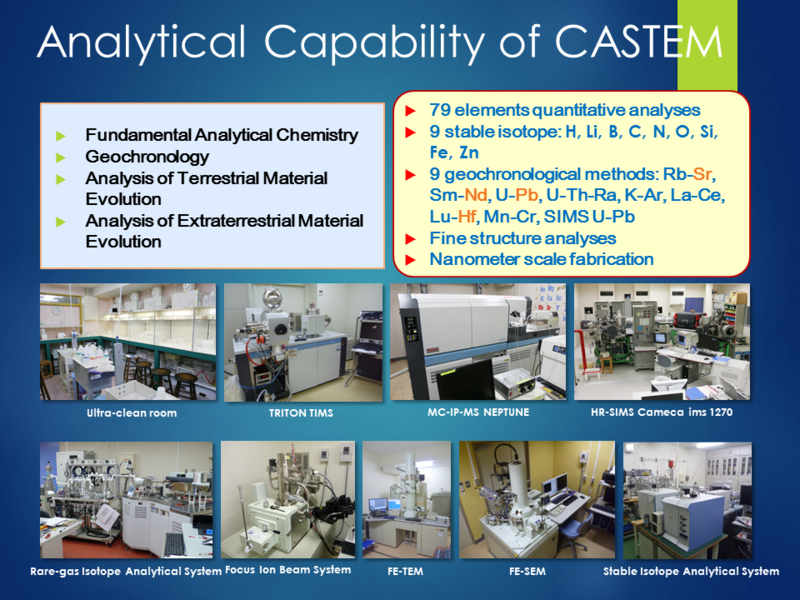 In CASTEM, precise and accurate concentrations and isotopic ratios of a large number of geochemically and cosmochemically important elements are routinely obtained. Thin sections of rock samples and high-pressure synthetic materials are prepared in order to examine textures by optical microscope (OM). Concentrations of major and trace elements (REE, HFSE, etc.) 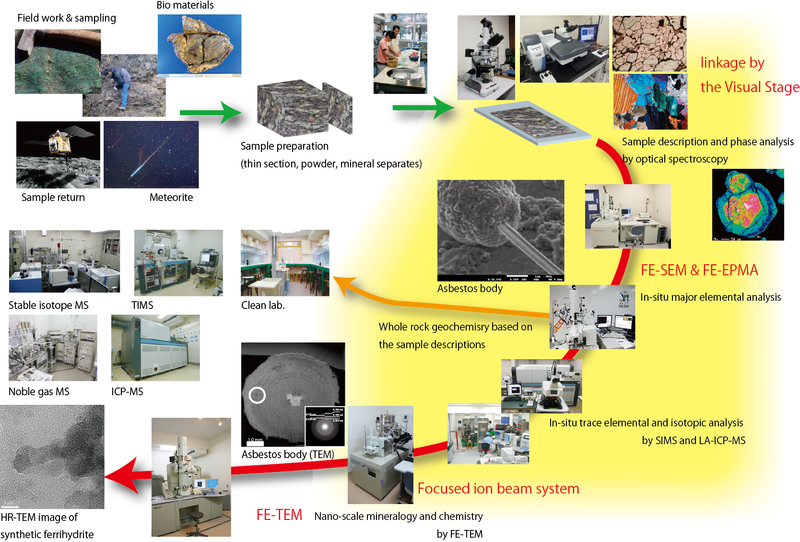 in individual mineral phases are then measured using a variety of instruments affording high spatial resolution, including a field-emission secondary electron microscope (FE-SEM) equipped with a energy-dispersive (EDS), wavelength-dispersive (WDS), and Cathodoluminescence (CL) spectrometers, an electron-probe multi-channel WDS microanalyzer (EPMA), a multi-beam Focused Ion Beam (FIB) micro-milling system, a field-emission transmission electron microscope (FE-TEM) equipped with an EDS and electron energy loss (EELS) spectrometers, a secondary ion mass spectrometer (SIMS), and a laser ablation inductively coupled plasma mass spectrometer (LA-ICPMS). Li–B–Pb–O isotope analyses and U–Pb zircon dating can be undertaken using a higher-resolution, multicollector SIMS. We have developed a Visual Link System (VisualStage) in which nearly identical stage positions (to within a few microns) can be rapidly achieved for sequential analyses by OM, FE-SEM (with EDS, WDS and CL), FIB, SIMS and LA-ICPMS. For wet chemical analyses of whole-rock samples and mineral separates, sample handling including mineral separation and powder preparation is undertaken in rooms with enhanced air filtration. Major element compositions of the samples are analyzed by X-ray fluorescence (XRF). The samples are then transferred into an acid-resistant clean laboratory and digested with acids, and the elements of interest are separated and purified. Concentrations of 74 elements are determined by ICPMS, and precise isotope ratio analyses for B–Li–Sr–Ce–Nd–Os–Pb–Hf are performed by thermal ionization mass spectrometry (TIMS) and by multicollector ICPMS. Age determinations using the Rb–Sr, Sm–Nd, U–Th–Pb, La–Ce, Re–Os, Lu–Hf, and Mn–Cr systems, and U–Th–Ra isotope disequilibrium, can also be undertaken, and C–N–O–S stable isotope compositions can be obtained using an isotope ratio mass spectrometer (IRMS). One of the advantages of CASTEM is that we can prepare standard materials for the in-situ analyses (by SIMS, LA-ICPMS, etc.) by first determining element abundances or isotope ratios by wet chemical analysis. Also, we can evaluate external standard reference materials in-house. Applying this analytical regimen, we have been investigating a wide range of geochemical and cosmochemical processes including mantle/crust recycling through subduction zones, mantle melt extraction, metasomatism, and compositional layering, the evolution of mantle plumes and crustal materials, the evolution of meteorites and, coupled with high P-T experiments, parameters such as trace element partitioning between melts and solids, trace element diffusion in melts, and kinetics.